an easy-to-understand way with numbers. Pre-consumer waste (cotton linter) is used as its raw material. While the total production of major fibers around the world is 89.06 million tons*, the production volume of Bemberg is 16,000 tons. 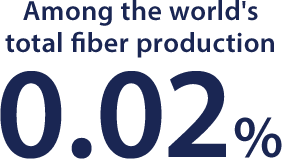 This means that Bemberg constitutes only 0.02%, making it a very rare fiber. The Bemberg plant uses power generation facilities owned by Asahi Kasei. 40% of the energy consumed in the plant is renewable and is derived from sources such as hydro power generation and biomass power generation. “Zero emissions” refers to efforts such as reducing and recycling waste, aiming to eliminate the waste that ultimately ends up in landfill. Asahi Kasei even recycles the waste from our plants and factories. For example, the fiber waste from the Bemberg manufacturing process is reused as fuel for power generation. Currently, Asahi Kasei has achieved almost 100% zero emissions. In summer conditions (temperature 35℃, humidity 80%), the weight of the material decreases by one half in nearly two months. In India, Bemberg is a familiar fabric that is used for traditional wear such as saris and dupatta. To make these costumes even more comfortable and even more beautiful, Asahi Kasei has been developing and proposing technologies for more than 40 years. We provide support at production sites to ensure that local people are actively involved at all stages of the value chain, from the procurement of the raw material (cotton linter) to the distribution of the final product. We also work to improve technologies, create employment, and secure stable income.